In October 2015 Mokoro launched a long-term multi-country strategic research project in support of women’s land rights. The WOLTS project has been initiated with a two-year pilot study in Tanzania and Mongolia focusing on the effects and impacts of mining investments in pastoralist communities. The study is examining the state of women’s land tenure security through participatory fieldwork in two communities in each country and seeking to identify the main internal and external threats to women’s land rights. From this evidence base, the aim is to develop, test, refine and disseminate tools to strengthen community capacities to respond to the threats and contribute to tangible improvements in women’s land rights, especially in the context of large-scale land acquisitions (LSLAs). Over the course of the last eight months the WOLTS team has been busy carrying out the initial background research and literature reviews, developing study methodology and selecting our four study communities. We have also formed exciting partnerships with community natural resource management NGOs in each country. In Mongolia we have partnered with People Centered Conservation (PCC) and in Tanzania we are working alongside the mining rights NGO, Haki Madini. Mongolia is a new working and research context for me. Having recently returned from our community selection visit to the country it seems an opportune time to share some thoughts on what makes Mongolia such an exciting country in which to conduct participatory research, especially with respect to women’s land rights and pastoralist communities. 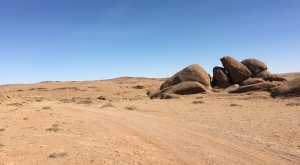 First, the exceptionally harsh conditions faced by Mongolians are immediately evident, with fragile natural ecosystems highly susceptible to degradation by natural and human factors and extreme climatic conditions. We stepped off the plane during our first visit to Mongolia in mid-November last year to minus twenty-something degrees centigrade temperatures, and were greeted by Mongolians clad in fur hats, long down jackets and camel wool and cashmere. This was just a hint of the winter weather to come for the Mongolian herding population (estimated to be about one third of the country’s total population) who can face temperatures reaching as low as -55°C. This past winter (2015-2016) was particularly harsh, referenced locally as a ‘Dzud’, and herders faced devastating cold, snow, storms, loss of livestock and food insecurity. During our next visit for community selection in April this year, carcasses of livestock that had fallen victim to the harsh winter conditions were only too visible along the road sides. Soum (district) governors in areas we visited were quick to highlight the effects that a dzud can have on their people, with specific communal pasture lands set aside for times of water shortage and harsh weather, and young herders increasingly seeing herding as an unsustainable lifestyle, choosing instead other livelihood options such as mining. Not only are the harsh conditions major factors in understanding our focus communities’ livelihoods and land rights, they also affect the practicalities of our research as we have to plan our fieldwork around the snowstorms and spring floods that would make getting around very difficult. The logistics of our fieldwork in Mongolia are also influenced by the sheer remoteness and isolation that many herders live in, meaning careful attention is necessary in designing our methodology to ensure we are able to fully engage with everyone in our selected communities. Mongolia has one of the lowest population densities in the world, with an average of two people per square kilometre. Only Greenland has a lower population density. During our community selection visit we covered vast areas of the country, driving nearly 2,500 km, and we could drive for kilometres, particularly within the Gobi aimags (provinces), without seeing a single house or ger. It is not quick or easy to get around either! Out of 50,000 km of roads in Mongolia, only about 10% are paved. All the others are gravel and dirt roads, and at times it was hard to tell whether we were even driving on any tracks at all as we just seemed to be crossing uninhabited desert, with the odd change in elevation seeming to act as our driver’s GPS navigation system! Our stakeholder interviews, extensive literature review and community visits have already uncovered some interesting issues with respect to gender. On an initial look at the gender situation, Mongolia doesn’t perform badly with respect to equality between men and women, and Mongolia’s regulatory framework for gender equality is relatively strong. Mongolia has a Gender Inequality Index (GII) value of 0.325, ranking it at 63 out of 155 countries in the 2014 GII. However, there are pronounced gender biases in Mongolia: the labour market is highly segmented by gender; there are gender remuneration gaps; and, with a cultural norm for men to be primary decision makers, there is disproportionately low representation of women in political decision making, with just 14.47% of the seats in the last (outgoing) national parliament occupied by women. Domestic violence is also a serious issue in Mongolia, particularly in mining areas. Conversely, there is an inverse gender gap in the education sector, with greater numbers of men entering the labour market without completing secondary education and boys in rural areas tending to drop out of school early in order to support their family’s herding activities. In Mongolia 85.3% of adult women have reached at least a secondary level of education compared to 84.1 % of their male counterparts. At the same time there have been negative gender impacts from the land privatization that took place after the end of the socialist period in the 1990s. A report by the Asian Development Bank (ADB) (2005) showed government regulations had not proactively supported gender equality in access to or control over newly allocated land. For example, the regulations did not question traditional definitions of “family” and “household”, so only those officially registered as a married couple or as a household unit prior to 2003 were initially entitled to land. Some land also ended up being registered in the names of male household heads only, as other adult household members were allowed to waive their right to be named on titles of newly allocated land. The ADB study found that just 30% of registered land titles were registered jointly to husbands and wives, and only 16% were registered to wives. As we now move into the more extensive fieldwork phases of our WOLTS pilot study, we look forward to learning a lot more about the gender dynamics of land rights in the context of pastoralism, mining and LSLAs in Mongolia. It is notable how little research has been done to date with respect to women’s land rights and the gendered impacts of mining and LSLAs on land tenure security in pastoralist communities. Unlike in Tanzania, and elsewhere in Sub-Saharan Africa, there are only a modest number of NGOs and other stakeholders working on related issues in Mongolia, but we are pleased to have had a very positive response to our study from everyone we have met so far. There is a definite feeling of optimism and excitement among all members of the WOLTS team, and we hope to be able to make a very real contribution to the evidence base on the threats that mining poses to women’s land tenure security in herding communities in Mongolia – as well as to the solutions. UNDP (2014) Gender Inequality Index. National Committee on Gender Equality (2012) Women’s Participation and Representation in Political Decision Making Level. UNDP (2015). Human Development Report 2015. ADB & World Bank (2005). Mongolia Country Gender Assessment.